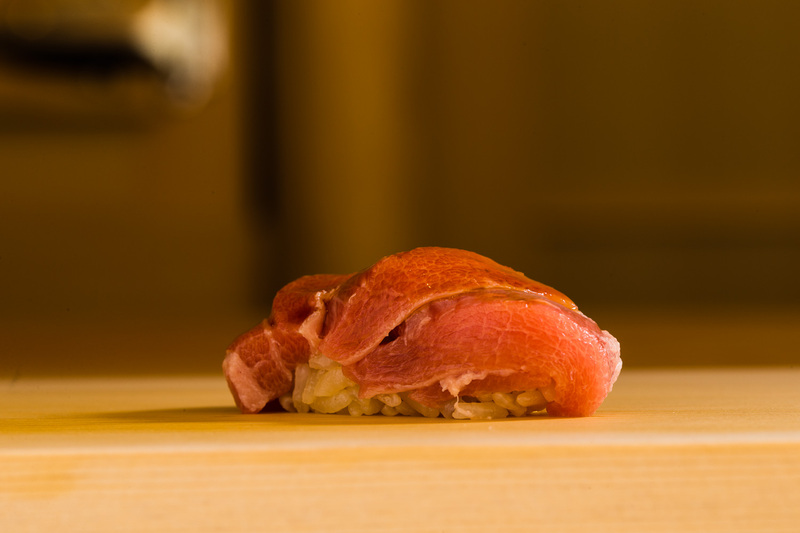 In the heart Kyoto’s historic district, a young sushi master is embarking on a challenge. 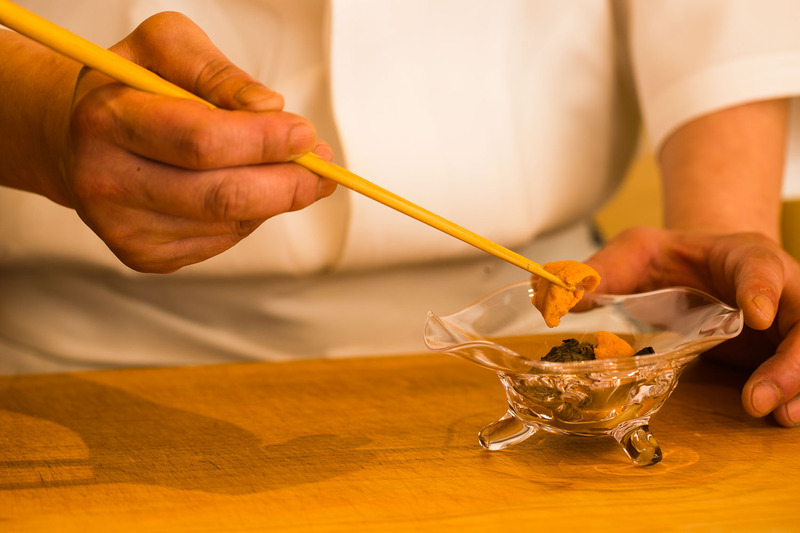 Leaving behind his home base in Tokyo, Chef Tadayasu Morita’s first restaurant is founded on passion for Edomae sushi and traditional Japanese arts. 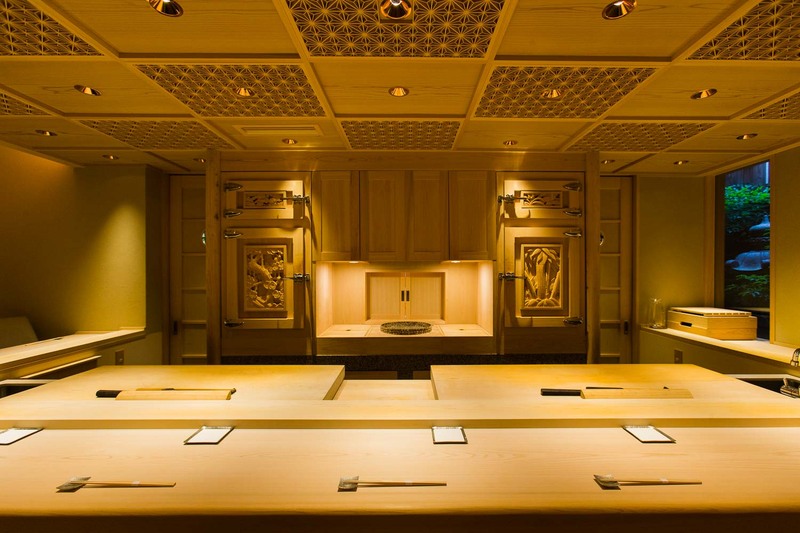 Set in magnificent decor, Gion Sushi Tadayasu is establishing its own unique presence in the city’s sophisticated culinary scene. Gion Sushi Tadayasu opened in spring of 2017 on perhaps the most picturesque corner of Hanamikoji in Gion. Surrounded by old tea houses and swaying yanagi trees, you may be lucky to spot a maiko or two walking down the stone-paved streets at dusk. The beauty of the old neighborhood is at the essence of the restaurant's experience. Reflecting true Kyoto aesthetics, the exterior of the restaurant is simple yet refined, set with bamboo shades and shoji windows. The noren curtain hanging over the entrance has the restaurant’s name in calligraphy, written by artist Taikyo Yoshino. As you step inside, the very first thing you notice is the refreshing scent of wood. Every piece of log in the room uses hinoki, the Japanese tree with beautiful smoothness and deep aroma. From the window at the back, you can gaze into the lovely courtyard garden. There is a private room on the second floor as well for a quieter setting. The main room is filled with subtle but gorgeous details of Japanese artistry, from the kimiko ceiling to the wood carving on the fridge door. Designed by Nagoya craftsmen, each corner of the wood carving features symbols of four seasons—orchids, bamboo, chrysanthemum and plum. The wall below is made from a special slate of granite, decorated with stained glass. The fridge, embedded in the wall behind the counter, is not only exquisite to look at but reflects the chef’s dedication to authenticity. To keep the fish cool with the perfect level of moisture, it uses blocks of ice, not electricity. It doesn’t stop Morita from adopting the most unusual methods, if they guaranteed the best outcome. Morita and his partner offer a real treat for the twelve guests that were lucky enough to get a seat at the counter. Served only top-quality fish flown in from the Tsukiji market in Tokyo, you are in for an unforgettable sushi experience. Gion Sushi Tadayasu’s foundation is classic Edomae sushi, which applies long-established techniques that are designed to bring out the natural flavors of each fish. The meal begins with a repertoire of six to seven small tsumami dishes, all simple yet refined. 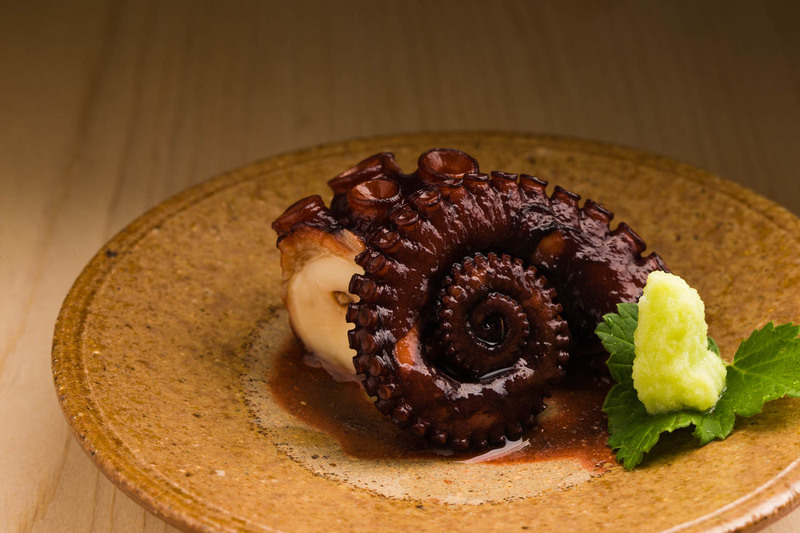 The tender pieces of octopus are cooked for hours in soy, soaking up the flavor of the tasty broth. 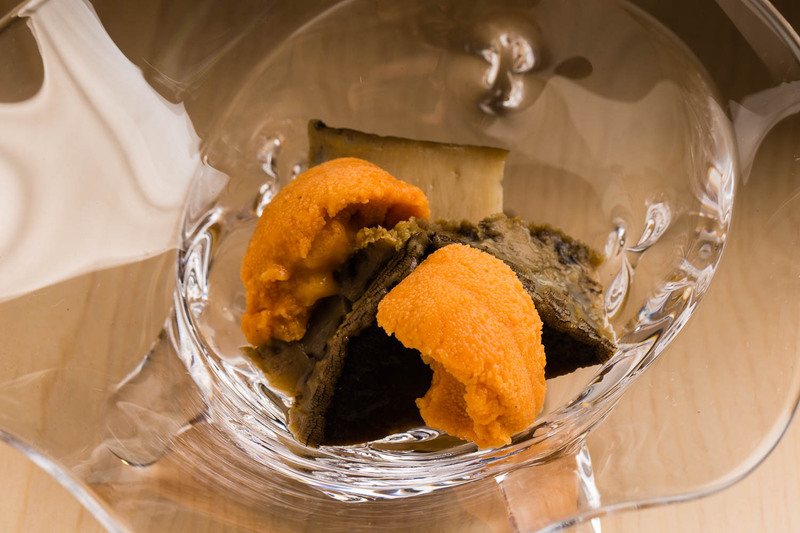 Black abalone is infused in umami of seaweed and sake, and topped with bafun uni, the sweetest of sea urchins. The grills are slow cooked using charcoal, featuring the best of seasonal catches that go perfectly with selected sake. Following the appetisers are about 15 different kinds of sushi, all wonderful flavors of the season. The day’s fatty tuna came from a 143 kg fish caught using a fixed fishing net off the coast of Kagoshima. The slab is matured at the right temperature before slicing it into beautiful, sweet, marbled slices. 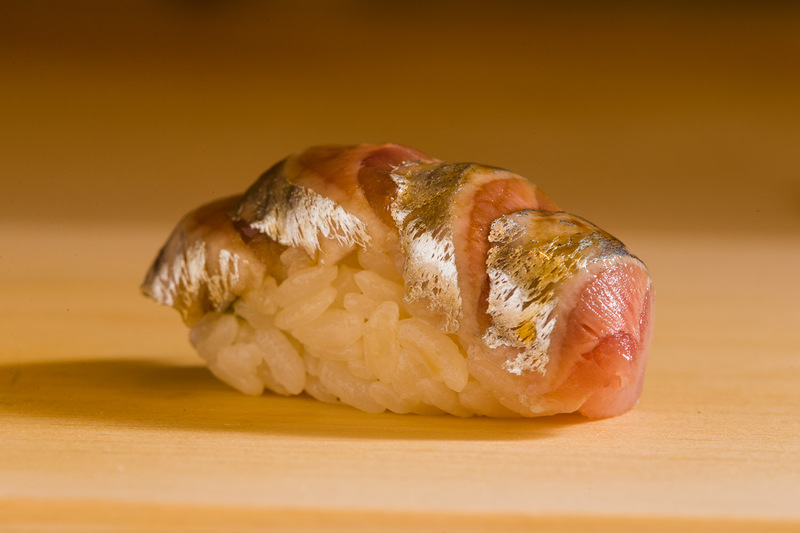 The gizzard shad from Kyushu, a classic Edomae sushi fish, is only gently cured. 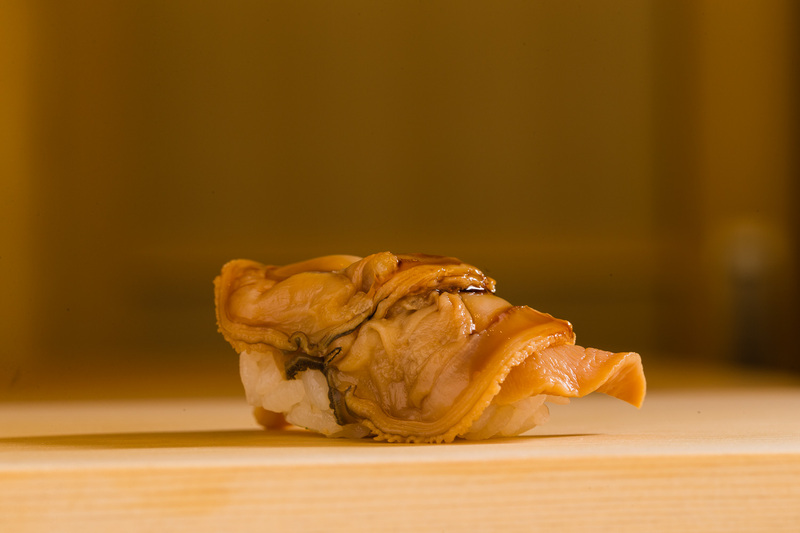 The juicy and plump piece of Hamaguri clam is marinated in its own broth and sugar. Topped with slices of yuzu, so much umami bursts in your mouth with every bite. Four slices of sardine are generously layered on top of each other, an original style that Morita came up with. The chef chooses from two bucket of sushi rice, one made with just one type of red vinegar, and another that blends two different varieties. The latter is perfect for sweeter and fattier fish like tuna or sardines. 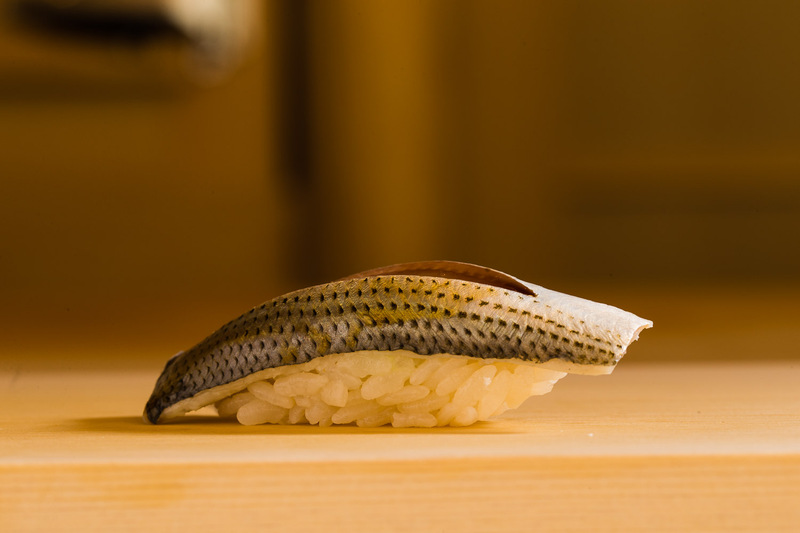 The size of the rice pieces is also carefully adjusted for each kind of fish so that it comes apart beautifully in your mouth. All fish is flown in daily from Tsukiji in Tokyo, the market that brings together the world’s best catches. He looks for as many as twenty different wild fish caught in Japanese seas. As he can’t physically be at the market himself, the relationship he has built with the sellers is key. The rice is small Akitakomachi grains grown in the mountains of Akita. Firm but light, the grains come apart in your mouth. The restaurant stocks a variety of carefully-selected drinks, ranging from local Kyoto sake to Champagne to wines. 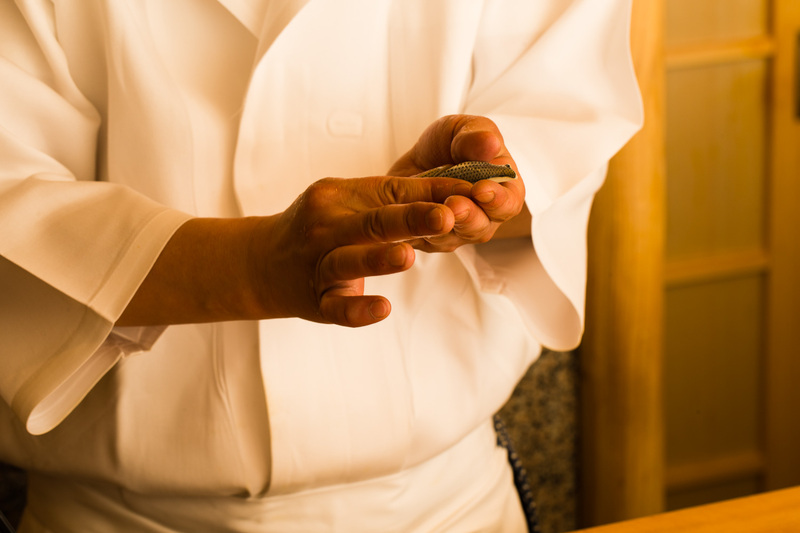 Born a son of a fisherman, Morita wanted to become a sushi master since he was a little boy. As soon as he graduated from high school, he got his chef license and began working at a sushi restaurant in Tokyo, where he learned the basics over the next six years. He then became the No. 2 chef at Aoyama Sushisen, before taking on the head chef role at Sushi Sagane for the next five years. In 2017, fate brought him to Kyoto to open a restaurant he could call his own. For years, he had been in love with Yasaka Shrine, and dreamed of moving there. He still often visits the shrine for peace of mind. Not yet 40, he decided to take on a challenge in a whole new stage called Kyoto. 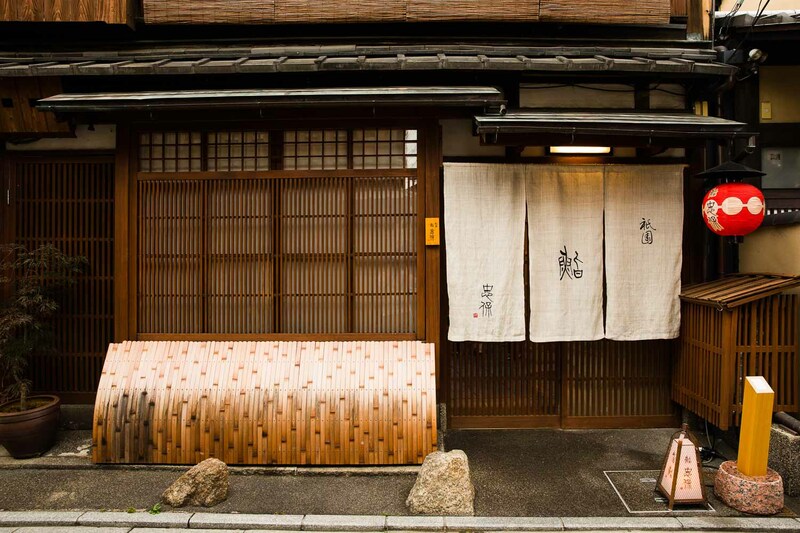 His primary mission is to establish the restaurant’s business in Gion. Now a year since the open, the restaurant is starting to receive recognition. He hopes to continue committing his time and energy in serving every guest. A true believer in the art of sushi, he is focused on passing on his values and techniques. He is grateful that Naoyuki Setta, a colleague from his Aoyama Sushisen days, has joined him in Kyoto and stands with him at Tadayasu. Together, they hope to teach younger sushi chefs in mastering the skills and taking on bigger dreams of their own. Rather than collecting antique pieces, Morita likes to order customized pieces from contemporary artists. 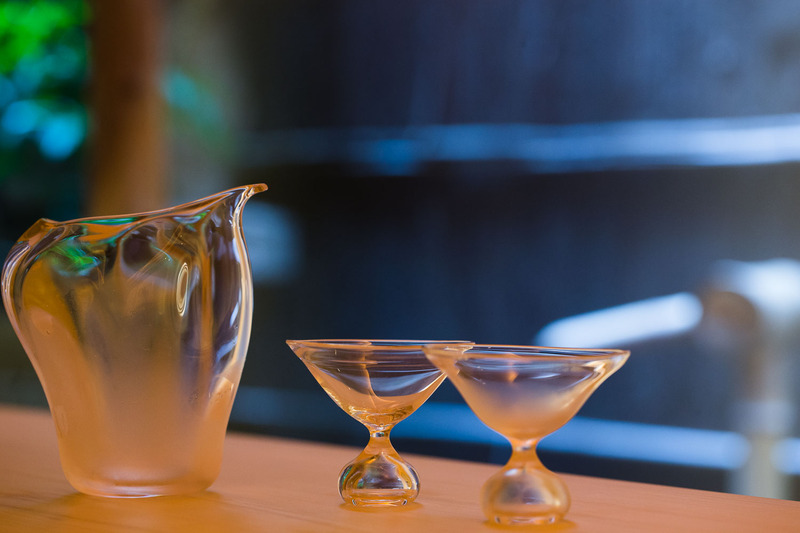 The numerous glass pieces that appear throughout the meal are the works of Satomi Sugie, a Kyoto artists who creates unique sakeware with beautiful curves. 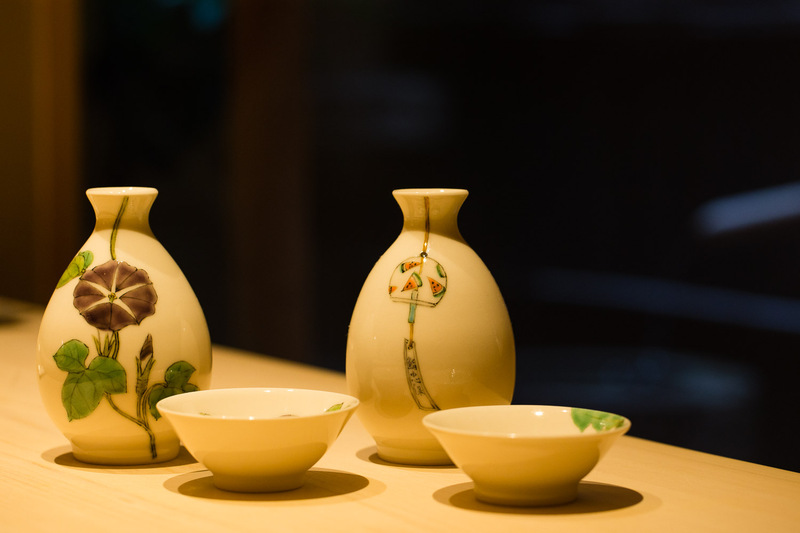 The ceramics by Kijoka is another favorite of Morita’s, especially the series that illustrate the four seasons including the sake bottle with watermelon and furin windchimes.